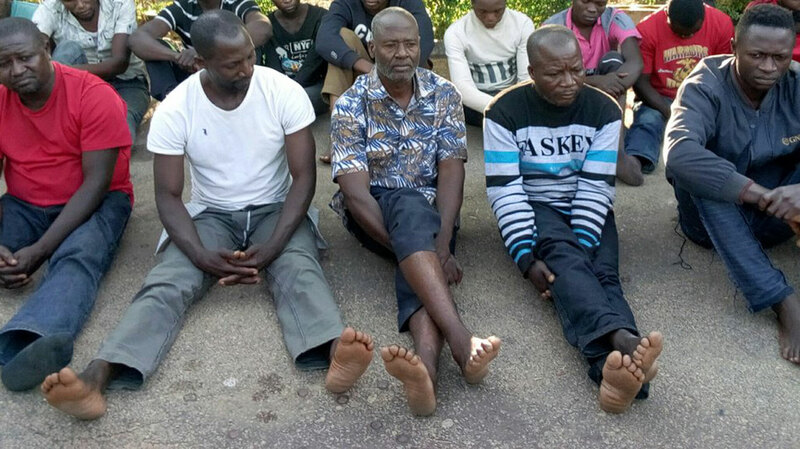 The Plateau State police command yesterday paraded 19 suspects handed over to them by the military, stating their levels of involvement in the disappearance and death of Major Geneneral Idris Alkali (rtd). The police said six out of the eight suspects declared wanted in connection with the death of Alkali have submitted themselves to the command, adding that two were still at large. This was disclosed by the Police Public Relations Officer (PPRO) of the command, DSP Mathias Terna Tyopev, while parading the six suspects who submitted themselves and 13 others who were earlier paraded by the military in connection with the crime but have been handed over the police. Tyopev gave the names of the six suspects who submitted themselves as Stephen Chuwang, Timothy Chuwang, Mathew Chuwang Rwang, Yakubu Rapp, Pam Gyang Dung and Moses Gyang. The PPRO gave the assurance that efforts were being made by the command to track down the two suspects at large. According to Tyopev, Pam Gyang Dung is believed to have participated actively in the killing of the general; Michael James saw when and how Alkali was killed but concealed the information. He knew the people who killed the general. Mathew Chuwang Rwang, the youth leader, was among those who exhumed the body from Doi Du and relocated same to Gushwet Shen. The only female among the suspects, Rebecca Gyang Pam, organised a protest against the draining of the pond where Alkali’s car was recovered. Others were accused of knowing but concealing information about the general. Tyopev said emphatically that the body recovered from the abandoned well was that of Alkali as the public and journalists witnessed the event. He said the suspects would be charged to court as soon as possible according to their involvement. However, the police did not allow journalists to interact with the suspects. It would be recalled that the body of the general was found in an abandoned well in a bush at Gushwet village in Shen, Du District of Jos South Local Government Area of the State on October 31. According to the Garison Commander, 3 Division Rukuba Barrack, who also doubles as the commander of the Search and Rescue Operation, Brigadier General Umar Mohammed, on the day the remains of the general was recovered, one of the suspects who took part in the relocation of the body led the joint team of the army and police to the well. The Nigerian Army on Saturday buried the body of Alkali at the military cemetery in the Gudu District of the Federal Capital Territory, Abuja. Senior officers, led by the Chief of Army Staff, Lt.-Gen. Tukur Buratai, held prayers at the cemetery before lowering Alkali’s body into the grave after full military honours were given to it. The burial, which was concluded at about 3:00p.m. was also attended by former Military Administrator of Lagos, Brig.-Gen. Buba Marwa (retd. ), and a former Minister of Works and Housing, Alhaji Sanusi Dagash. In another development, motorists plying Lekki-Epe expressway may now heave a sigh of relief as two notorious armed robbers who specialised in robbing commuters, Akpan Samuel and Ani Chukwuma, have been remanded in Ikoyi prison after their arraignment at Igbosere Magistrate-Court at the weekend. 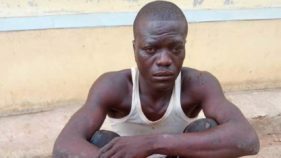 The Lagos State police spokesman, Chike Oti, said the suspects were arrested by operatives of Maroko Police division in Lekki, led by the DPO, Isa Abdulmajid. According to Oti, “the suspects who were nabbed on October 29 by operatives of the command led by the Divisional Police Officer, Maroko Division, CSP Isah Abdulmajid, revealed during interrogation that their modus operandi was to mount the pedestrian bridge at Maruwa bus-stop on Lekki-Epe expressway. From that vantage position, they were able to monitor the traffic and carefully select their target. “They thereafter, swoop on their target and rob them of their valuables by means of a big hammer used in smashing side glasses and windscreens of drivers who refused to roll down their glasses when ordered to do so. The hammer and an improvised pistol that appears like a perfect prototype of a berretta pistol were recovered from them.